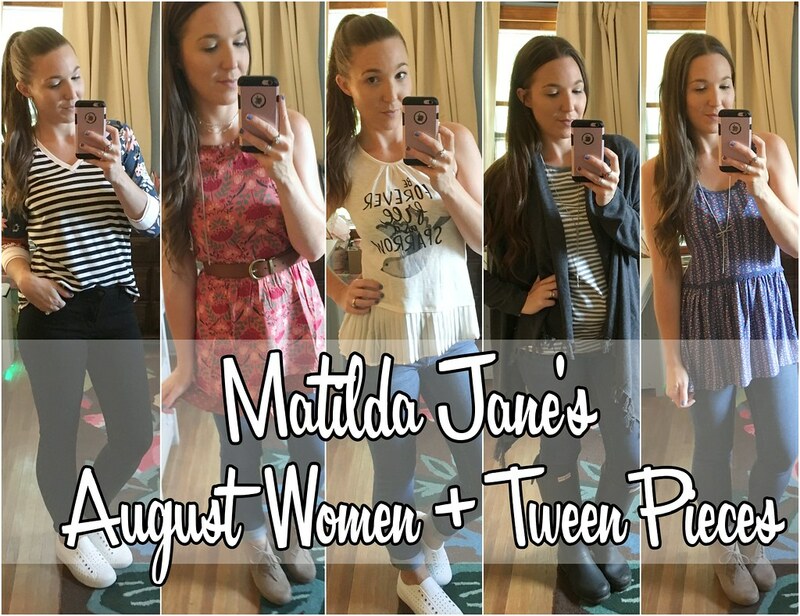 Matilda Jane's Choose Your Own Path Jane Parade! In case you missed it, MJ had a small online-only release a couple of weeks ago, featuring solids and perfect layering pieces that will mix and match with MJ and everything else in your closets! The Not-So-Basic line will be continually refreshed, so despite any sell-outs or backorders that might happen, these pieces will be available again and again! I originally picked up just two pieces from this line knowing that I could get more later on (I've still got my eye on that black maxi, and the midnight teal big ruffles), so let's start with those! First, I HAD TO HAVE this cardigan! Remember the Come On Over Cardigan? It was everyone's favorite - it's such a great piece. 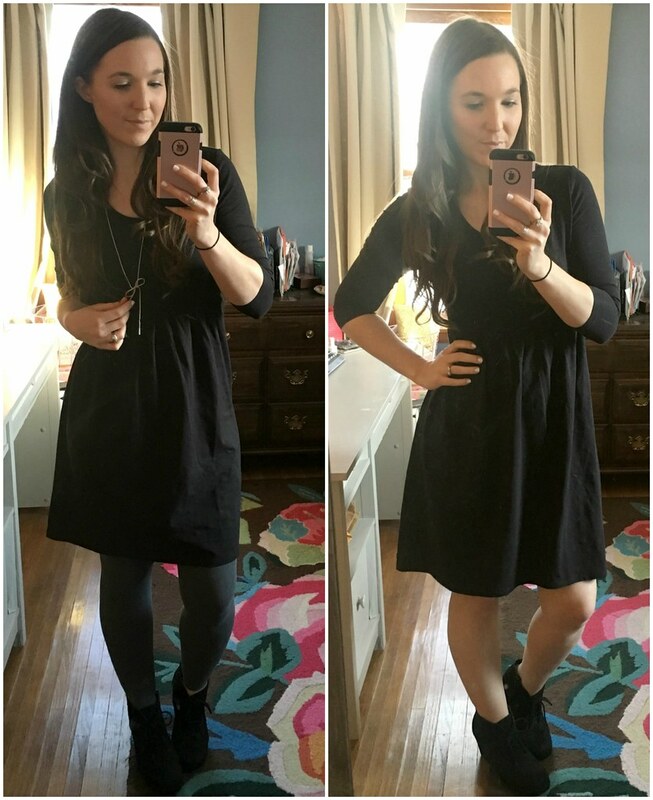 I wear mine all the time in cooler months, so I was SO HAPPY to grab it in black! This one is called the Warm Smile Cardigan, and t's gorgeous, flattering, not-too hot, legging friendly, and gets all the compliments! I'm wearing a small and it fits pretty TTS - the fabric is generous but the sleeves are a touch on the shorter side. Same as the original! I also grabbed this staple grey stripe tee. 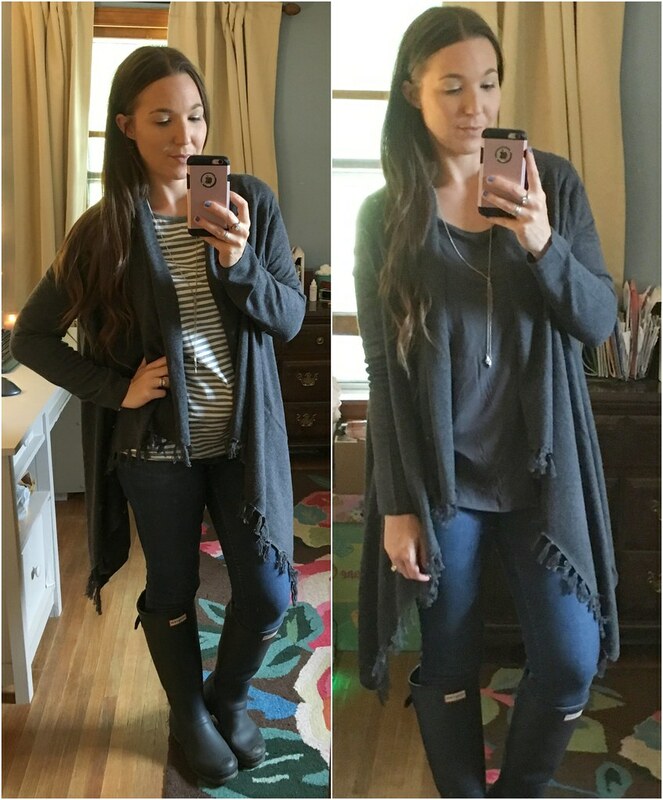 When I saw it I knew it would be perfect for layering with vests and sweaters in the fall! 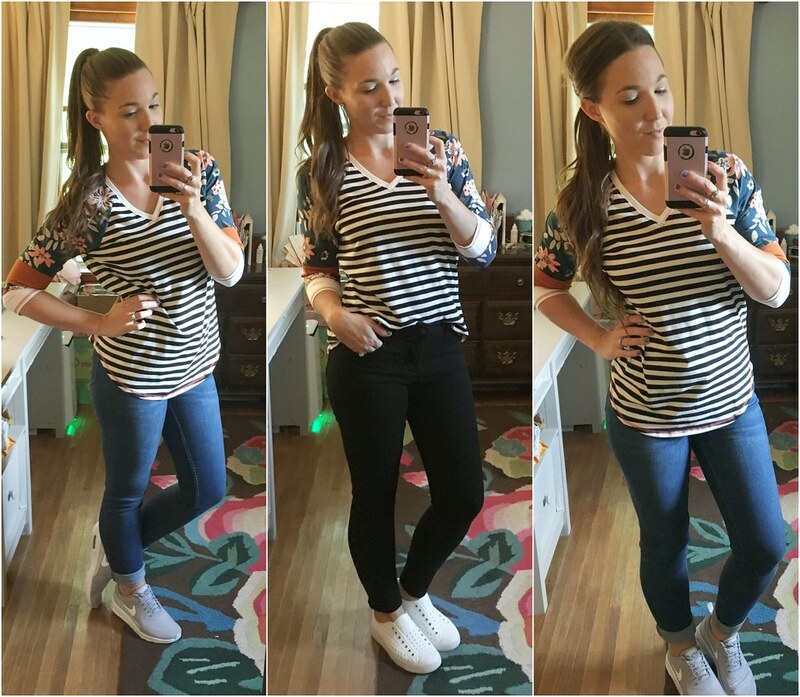 This First In Line Tee is MJ's popular fitted style, and while it's super cute and pre-baby me would have loved it as is, I size up in these to keep from putting my mom belly on display! haha So I'm wearing a medium above and I love it. SO soft and comfy! These basics are perfect for the new-to-MJ crowd! Don't forget to scoop up a Discovery Dress, which is one of my favorite dresses of allll time! And now for MJ's Fall season....Choose Your Own Path! I love the idea behind this theme - supporting girls in following their heart and blazing their own path. You'll see that in the assortment of items in the fabric patterns and the variety of styles available for girls of all kinds! My favorite piece is this baseball tee, which is kind of a surprise - just because these tops usually don't take the #1 spot on my MJ wishlist. They're always super comfy and cute, but there's something about this one! The stripes are black, and the sleeve background is blue so it works with pants of all kinds. SO cute, isn't it? I think that middle outfit is my favorite thing from this whole Jane Parade! I'm wearing the medium here, which is a little baggy but not overly so, which means it's TTS. I ordered the small for myself and I think it'll be perfect. I think my next favorite piece in this line has to be the River Rock Cardigan. Yep, a third color of the original "Come On Over Cardigan"! These are so light yet cozy and add an easy touch of style to any outfit. This one came to me in a medium, and I think I'm going to keep this one in this size. The arms fit a little better, and despite there being a bit too much fabric, I think that's totally fine for this type of cardi. Love this grey color!! I wore it over the First In Line Tee & the top layer of the Heartwood Top above. Speaking of the Heartwood Top, fans of last year's From Within Tee will be happy!! You basically get two for one with this great top! 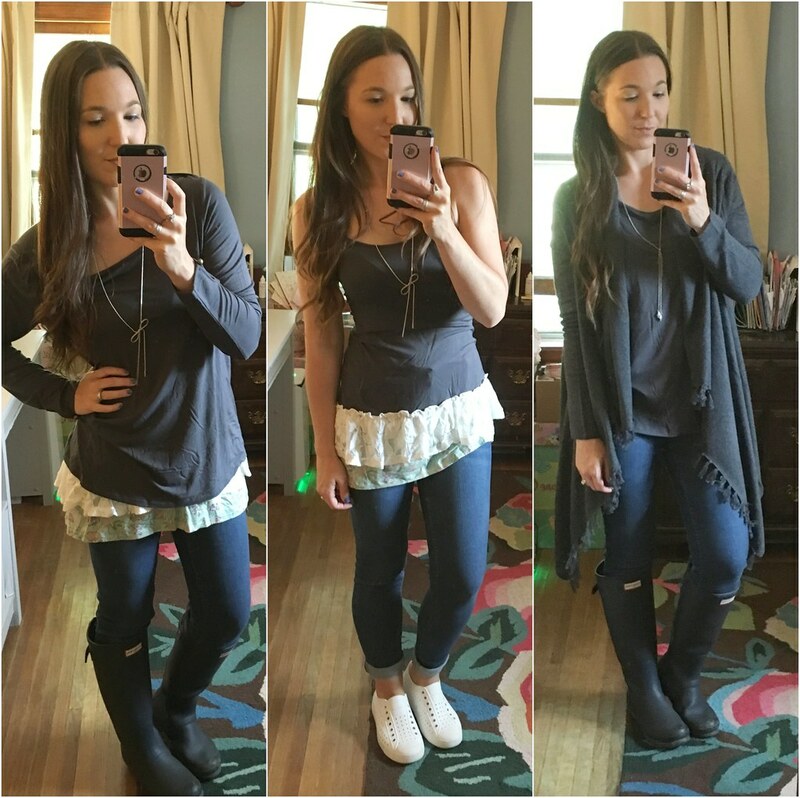 Both layers are made from the softest, coziest material, and can layer together for a cute layered look, or split them up and wear them on their own. I love the neutral grey on this one, it'll be great for fall layering! I'm wearing the large above, and I'm still trying to decide if I should get the small or XS. The bottom layer runs large and the top layer runs tts, so it's hard to decide! Another favorite from this line is a tank that will be a great transition piece in September! This is the Beyond the Horizon Tank, and it's effortlessly cute! I'm wearing the medium sample above but it's pinned in the back - I ordered the small for myself. Pretty tts! The last women's top this month is the Willow Top. It's a light, crepey-rayon top in a beautiful shade of coral. My favorite part of this top is the tassels on the side - such a cute detail! (Though hard to see in my photo.) I'm wearing a large sample above that I pinned for photos, but I'd choose a small for myself. I didn't grab mine when I was trying things on, but this would be SUPER cute with one of our shirt extenders! Before I move onto dresses, here are a couple of vests available starting today! On the left is a tween vest, called the Winding Path Vest, and on the right is the women's Ambitious You Vest. 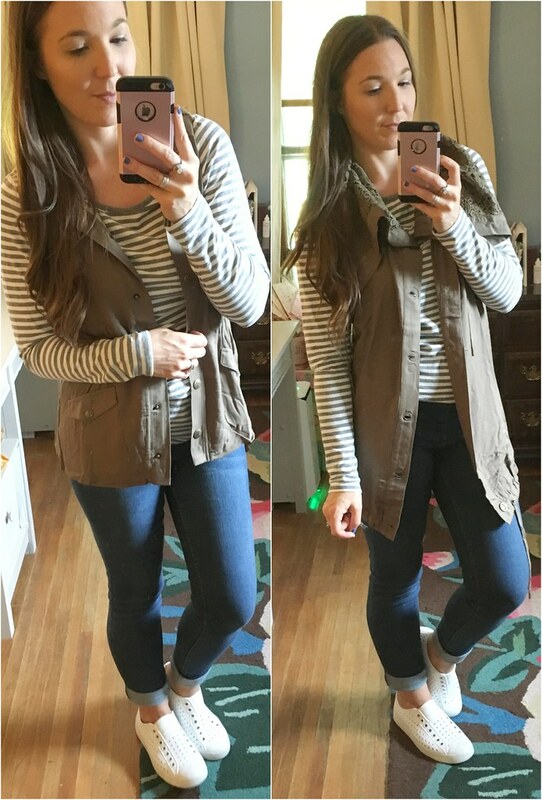 I really like the tween vest - I'm wearing it in a 14, and I think it looks super cute with a lot of the fall pieces. The women's was harder to judge, my sample was a large and it's hard to pin a vest in the way you think it will fit a few sizes smaller. I'm thinking it's a generous tts. There are two women's dresses this month. The first is a sweetly styled maxi that is SO comfortable to wear! This is the Chasing Waterfalls Dress, and it's made of a smooth, bouncy rayon/spandex blend. I love the waist detail - MJ styled it with the ties crossing in the back and tying in the front, but I love them tied in the back. I tried to get a photo but it didn't turn out - the extra-long straps draping down the back look so pretty! Guess what else - this dress comes in regular length and petite! So if you usually trip over MJ's maxis, there's an option for you!! I'm wearing the regular length medium in this, and it almost fits! It's just a little loose in the ribs, so I'd size down to a small. The other dress is the Woodland Sprite Dress. I love the floral on navy print on this dress, and it's such a soft, light, breezy dress for August & September. It looks effortlessly dressy, too, thanks to the ruffle detail on the top and the sharkbite hem on the bottom. I'm wearing the Large here, which I've pinned for photos, but kind of unsuccessfully - my pins didn't hold well so it looks pretty loose. I would need the small, maybe XS in this one. 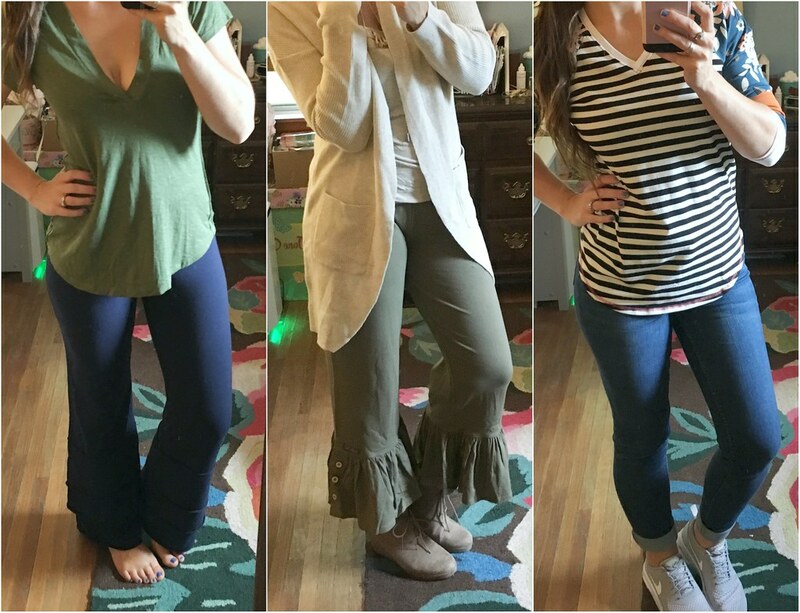 There are also three pairs of pants for women this month! First are a pair of Finns - the Vagabond Finns in a perfect neutral navy. I'm wearing the small on the far left, and this is my normal finn size. In the middle are the Treetops Big Ruffles, which are a pretty faded sage that will pair well for fall! I'm wearing the medium, and they fit a little loose so I'd get my normal small (also my ruffle size). And finally - JEANS! Did you know I was sneaking them into this whole post? ;) Yep - MJ did jeans!! My favorite part is an embroidered hummingbird on one of the back pockets - I love hummingbirds! I'm wearing the 8's in this photo, and while the legs fit, the waist is quite large. I normally wear a 6 in jeans, so I think that would fix the waist issue, but I'm not sure how the legs would fit. I haven't gotten a pair yet, so I'm not sure how to advise!! They are called Soar Ahead Jeans, and they come in sizes 2-22. I have just a couple things to share from the tween line, but they're super cute!! I LOVE this Be Free Tank - the asymmetrical pleated trim makes it so super special! It also has an original watercolor bird from our in house artist, and hand lettering by one of our designers. It's seriously an adorable work of art! I'm wearing the 12 above, and would size up to the 14. And then I have the Picking Flowers Dress as a tunic. I love turning tween dresses into belted tunics - my favorite little MJ trick! This one has great fall colors for layering with brown accessories, too - I was surprised by how much I liked it!! 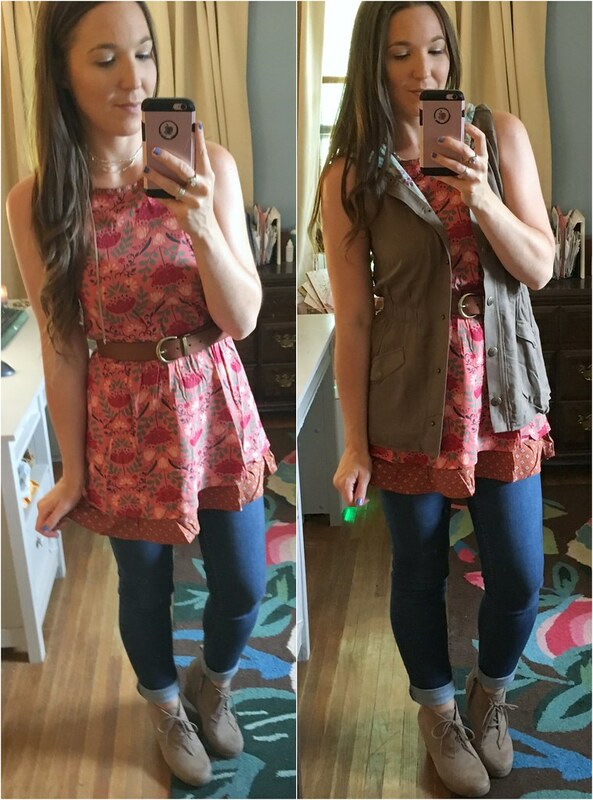 I layered it with the tween vest for fun, too! I'm wearing the 12 above and would absolutely need the 14! Too tight in the chest at this size. There's also a sweet blue tee called the Believe in Yourself Tee that I really really like, but my sample size wasn't big enough to try on for my Jane Parade. Check it out though - it's a perfect blue! Okay, last thing! This month's promo is SO FUN! 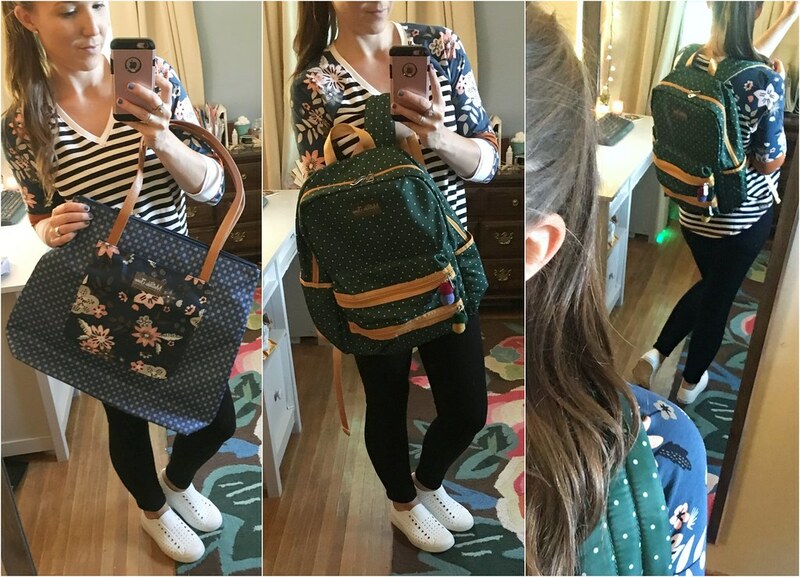 When you spend $175, you get to pick a backpack for only $25! I love both the blue and green ones! I only took photos with my two favorites, but check them all out online! I also ordered 2 other pieces that I just ordered last night so I don't have them to share - the Power Pose Jumpsuit and the Fork In The Road Tank. I can't wait to see them in person!!! So tell me - what's your favorite?? I think the baseball tee still wins for me this month! Visit me in my VIP group to chat more about this release (and the four others to come this fall!!) and stay up to date on all things MJC! Your reviews are always the best! Lots of pretty pieces this time around. Thanks, friend!!! I love my job! :) There are lots of pretty pretties this month, I can't wait to see what else they have in store this fall!